Leslie Basham: Here's Melissa Kruger. Melissa Kruger: If you walked into a mall and asked people, "What's you're purpose in life?" You'd get a thousand different answers. But I think a lot of it would come down to, "Well, my purpose is to generally be happy and be comfortable in life." That's how a lot of us spend our time raising our children. I think the Bible lays out a completely different purpose. That purpose is to know God and share Him with others. Leslie: This is Revive Our Hearts with Nancy Leigh DeMoss for Thursday, October 15, 2015. Nancy Leigh DeMoss: Why do you exist? Why does your family exist? Without answering basic questions like that it's really easy to get lost in the hub-bub busyness of life. It takes intentional, determined purpose to be sure we’re following God’s plan for the days He’s given you. It’s especially easy for moms of little ones to get caught up in a cycle of busyness and forget why they’re doing what they’re doing. Today two younger moms will talk about that. Our guest is Melissa Kruger. She’s written a eleven-week Bible study called Walking with God in the Season of Motherhood. She encourages moms to set aside some time each day—even in the middle of the busyness—to connect with God through His Word. And then, out of that relationship with Him, to live life purposefully according to His will. My friend Erin Davis interviewed Melissa earlier this year at the Gospel Coalition’s National Conference. Erin is the lead blogger at the Lies Young Women Believe Blog for Revive Our Hearts. Let’s listen as Erin and Melissa offer practical help for busy moms. Erin Davis: All right, so, I'm looking at this great resource of yours called Walking with God in the Season of Motherhood. I just want to know your mom credentials first, so tell me about your own family. Melissa Kruger: I am very fortunate. I have three kids. I have a daughter who's fourteen. I have a son who's eleven and another daughter who is eight. I love the stage of life we're in with them. It's a fun stage. Somebody asked me last night, "Have you said that about every stage?" I was like, "You know, I have." So, I've really enjoyed them at every stage, but right now I think they are at great ages. Erin: That's great. I think sometimes whatever stage we're in is our favorite, and we look back with such nostalgia on the other stages. It's good to be excited about what they're in. What about your role as a mom to those three kids made you think, I'm going to write a devotional for moms. So sometimes I think motherhood helps us realize we don't have it all figured out. So, you're mothering, what about that experience made you think to write to other moms. Melissa: Well, it actually started . . . I had my first baby living in Edenborough, Scotland. So I was living far away from everyone I knew. I remember when she was born I thought, I know more than anything else I need time with the Lord. But I have to admit when I came to my time with the Lord, my brain was fuzzy. If you're reading Acts you're thinking, I can't even get out of the house to go to the grocery store much less get the gospel somewhere. You know, sometimes I was just struggling with how do I read the Word and relate it to my role as a mother. What I really wanted was someone to take me by the hand and say, "Read this passage. And here are some questions to help you apply it to your life." Because I knew I needed the Word, but I was struggling to find ways to get into it. While I found many great parenting books and I found great devotionals, what I didn't find was something that put me in the Word and asked me questions in response. Because it's a brand new season, and it can be difficult. So the reason I started writing this though was actually if you fast forward about twelve years, I had a dear friend who had walked through all the young mom stage with me when we moved back. She had gotten married and was now pregnant. So I actually wrote this as a shower gift for her. Her pregnancy kind of prompted me. I was praying for her one morning, and this whole outline came together because I'm not crafty. I couldn't sew her a cute blanket, so I thought I could write her this and give her the one thing I wanted when I was a young mom. As I was writing it, one thing I realized, it was just as much for me because it's not just for young moms. It's actually seeing the Word and applying it to our motherhood. I need patience whether I have an infant at home or whether I'm dealing with a teenager. Right? So most of the topics discussed is not just the baby world, but it's actually the mothering world we are in. Erin: What a baby shower gift! Wow! Melissa: I know. One of my friends wrote, "Over gift!" "You made the rest of us look bad." Erin: What I know from the book is that friend's name is Angela. So what did Angela say? Has she had more children since then? What's been the impact on her own life? Melissa: Yes. Actually, she now has two and is pregnant with a third. She finds out tomorrow what she's having. But the nicest thing, her husband called me when they got all the shower gifts home. He called me and said, "I looked around the room, and everything in here will fade. Everything in here will get old, and it will be passed along. But this will affect our children for all of their lives." Of course, I started crying. It was true. God's Word implanted on my heart will be impressed upon my children, and that's the greatest gift I can give them. Erin: Right. Well, we know that's the biblical model from Titus 2. That's how we learn to mother. That's how we learn to love our husbands and children. That's how we learn to be happy at home, because sometimes those things are really hard. Erin: So, another woman that is in a different season of mothering than you are maybe she can't write a Bible study, but how can moms show each other how to walk with God in this season of motherhood. What are we doing right as moms in that area? How can we improve in helping each other? Melissa: Yes. I think one way, if I'm a younger mom seeking advice from an older mom, I think one way is that we can learn to ask good questions. Sometimes we think if we just hang out with an older mom I'll learn? But I learned that sometimes I need to say, "Can you tell me any advice you might have for me? Can you tell me . . .?" Because I'm reticent to just start saying, "Here's what you should do." You know, I think we're all a little bit that way. Sometimes I'll phrase it in this way. I'll say, "What's one thing you look back and you're really glad you did?" Erin: So asking questions. We can ask questions of other moms. I think we're a little bit hesitant to do that. I'm not sure why. Melissa: I know. I think sometimes we don't want people to tell us what we don't want to hear. Melissa: And I think as an older mom, truthfully, I think sometimes we have to go back into the younger mom world. So we might just say, "Hey, when can I come over to your house and hang out with you?" And just enter back in. Because you know, as our kids are going to school, we can busy ourselves and kind of forget to look back to those young moms who are maybe home all day and feel really isolated. It could even be we bring our older kids over. Our older kids kind of entertain their younger kids while they're all playing, and then it provides us time to have a chat for a little bit. Some of it is just watching it being modeled. How does she talk to her children? How does she discipline her children? But I really do think as we do a better job of asking for help and asking for advice saying, "I don't know what to do. I'm at a complete loss." Those conversations can bear a lot of fruit and just be encouraging. Sometimes we just need to hear from another mom. Melissa: Yes. That's exactly right. "You'll make it through." That can be the best thing to hear. Erin: Yes. And then I think it's good to know a variety of other moms. I'm an early morning person, and so my time with the Lord is early in the morning. I know to say that to other moms and that makes them feel shame or embarrassment because they can't hardly pry themselves out of bed in the morning. They're up late at night. So to know that walking with God in this season of motherhood can look like a lot of different things. Melissa: That's right. For me it was during the kid's naptime. That was my discipline. I would leave the laundry; I would leave cups. I would say, "I need to go spend time with the Lord now." Because I wasn't a morning person. Now, actually that my kids are older, I do get up in the morning, because it's easier for me to do it then, now. But what's difficult when you have young children is you never know when they're going to wake up. Erin: That's right. Or even if they're going to go to sleep at all. Melissa: It really does seem like just when you set your alarm and you're up at 6 a.m., you hear the little feet pitter patter down the steps. And you're like, "I was trying. I was trying." So for me, naptime became the time during that season when I could get into the Word and have some quiet. Erin: I think it's so encouraging for moms just to know it can look different. Maybe it's when you're in your car waiting in the carpool line that's when you can have some time with the Lord. Melissa: That's right. That's what I love that they let me do with this book. All the Scripture's in this study. So a mom can take it with her anywhere, and the Word's right there. Because sometimes it's even awkward to have your Bible out and have a notebook out. You're carrying enough as a mom. So I liked that they let me put it all in one format. Erin: Right. That's great. Moms are going to love that. So, I love this description you give of motherhood in the book as mom's being a life sized version of "Whack-a-Mole" the arcade game. So one need pops up. You meet it. Whammo. Another need pops up and Whammo. And that really is an accurate description of motherhood. So what can happen to a mom who's in that state? I don't know if she's the mallet or if she's the mole. But anyway, it's Whack-a-Mole. She doesn't have her rhythm of regular time in the Word. What happens to a mom who's constantly meeting needs and yet isn't walking with God or doesn't have time with the Lord on a regular basis? Melissa: Yes. I think two things happen. I think one, the Whack-a-Mole game really does become just that. It has no purpose. We forget, "Why am I doing all this?" It just feels burdensome, "One more thing down." There's little joy because apart from the Lord we start losing our way. "Why does this matter? One more diaper to change. One more day all of the Legos spilling all over the floor and we're picking them back up. One more day of these mundane tasks." But I've found such a difference when I see it in light of doing it for the Lord. It changes everything. If someone important asks you to do something, if the President of the United States asks you to get a cup of coffee, you're thinking, Sure! I'll be happy to get that for you. Erin: Yes sir, Mr. President. Melissa: Yes. No problem. So to think the Lord of all the Universe has asked me to love this child, that infuses it with meaning. God has entrusted me with this soul to know Him, to share about Him with. It's a huge calling, and it changes everything about how I view it. It's not mundane anymore. I'm being the hands of Jesus to love this child in the Way. That is where He's asking me to pour out kindness and patience and mercy and to reflect His love to me to this little life. That changes everything. And then the second thing, just think . . . I love Psalm 19. It says, "The Law of the Lord is perfect reviving the soul; the statutes of the Lord are trustworthy making wise the simple; the precepts of the Lord are right giving joy to the heart." Well, do I want joy? Do I want revival? Do I want wisdom? Yes, as a mom. He says that's in His Word. The things I want the most I tend to chase. And maybe if I could just have a spa day, or I could just get some time alone. But His promise is actually in His Word. So if I want to feel joyful about that Whack-a-Mole game, if I want to feel revived for my daily tasks, the best place to go is actually God's Word to find that. Erin: I don't think a mom ever gets that elusive full night of sleep and then thinks, I don't need another full night of sleep again. Or you go on vacation and then you need a week to recover from your vacation. You know those things that we think will restore us—not that they're bad or we shouldn't rest—but I think you're right. What really brings restoration is the Lord. Without Him you're going to be running on fumes very, very quickly as a mom. Erin: Don't you think that's what can often lead us into our mom sins of being short-tempered and being angry and being bitter and being whatever it is. Those are mine. Yours might be different. That's me on Monday, every day. When we don't have that rhythm of time with the Lord, we're running on fumes and then we're harsh with out children. Then we feel guilty that we were harsh with our children. So then maybe we don't want to have time with the Lord because we're afraid He'll put His finger on what we know we're doing wrong as a mom. So it can be a little bit of a vicious cycle. Melissa: Yes. It really can. Erin: You say, "More than anything in my life, motherhood has exposed my need for grace." Which I agree with. I say, "It's the hottest refiner's fire I've ever been in." Erin: And yet, what I'm hearing from moms is, "I know I should be praying. I know I should be reading my Bible." But they're feeling more condemnation and failure than hopefulness. I'm wondering how moms can flip that switch to see their personal time with the Lord as a pipeline to needed grace instead of seeing it as another thing on their to-do list or something that the Lord is going to be angry with them if they don't do. What's the heart change that we can help momma's make? Melissa: I love the verse, "Taste and see that the Lord is good." I think some tastes are acquired. So I really think that time with the Lord is an acquired taste. You might have a bite of something and say, "Yes, that was okay." But sometimes we grow in our love for something. I think the more time we spend in the Word, the more hunger we get for it. It's not a quick fix. I think sometimes in our society we're looking for really quick fixes. We want to work out once and lose all the weight or whatever. Erin: Yes, we do! I do. Melissa: I know. So do I. So we want to, "Well, I ate well one day" . . .
Erin: Right. So now I'm going to go each cheesecake in the pantry. Melissa: Yes. Exactly. Exactly. Time with the Lord is something that's savored, and it has effect over time. It's really an act of trusting the Lord to say, "I'm going to spend this time even though I may not understand." Transformation is a process. I can say I started really studying the Word when I was fourteen years old. So it's over twenty-six, twenty-seven years ago. That started a daily habit for me that has continued through all the seasons of my life. I can say there has been nothing better in my life. The most real moments of my life have happened with the Word open and in prayer. That has infused every other part of my life with meaning. I want to tell my friends who are moms, "Come to the waters and your soul will delight in the richest affair." It's almost that we have to continually keep testifying to one another. Just like I'd say, "Hey, I got new shoes at a great department store. It was a great sale." We're very quick to tell each other those things. But to say, "Come meet with Jesus. This is where we're going to find life." I think that we have to keep speaking that truth to each other and encouraging one another in that because the world promises us so much and it really provides so little. But the Word promises us much and it actually does provide so much. Erin: I think we don't use the words "spiritual disciplines," the phrase "spiritual disciplines" very often. It's gone out of vogue. But it is a discipline like healthy eating is a discipline, like exercising is a discipline, like keeping your house clean-ish is a discipline. Erin: Right. So, I'm going to choose to do this because it's an important discipline for me. I'm thinking of a mom friend in my world who six months ago said, "You talk about your Bible like you actually read it. I don't know if you were to say a book of the Bible, I wouldn't even know how to find it. I don't know what you're talking about." And so I just said, "I just read it." And she wanted to know how I read it and how do I pick? She texted me at six o'clock this morning. "This is what the Lord showed me in the Word." I mean once she said, "I'm going to read it." You're right. The Lord really grew her and is transforming her. But she had to say, "Whether or not I understand it, whether or not I have a game plan, whether or not I instantly feel transformed, I see that there's real help in going to the Bible every day." She is being transformed with Him pretty radically. Melissa: That's why I think it's helpful to have studies because sometimes in this season of life we're taking care of everyone else. So you can't even think how to ask yourself an application question. I needed someone else to ask me, to make me think deeply about my life and how I even relate it to this passage. That's why especially in this season I think having helps are a good thing. Erin: What are some of your favorite Bible studies? Melissa: Oh, that's a good question. I love so many of them. I have one at all times. Right now, actually, one thing I just love doing is reading the Bible through in a year. I found this great one, actually this is one of those nice ones. Its five days a week, and over the course of a whole year you read the whole Bible. What I love about doing that is the way the Lord puts you in just the right passage just the right day. You started it in January and now it's August, and that was the exact verse you needed. And you say, "How does that happen?" You get to see these marvelous things in His Word that you'd miss. But then I just love, I love Nancy Guthrie studies; I love Kathy Nielson studies; they help you just to get in the text. Especially, I did Kathy Nielson's on Isaiah. That's a big book. I don't really know what all is going on in that book. There's a lot happening. So it's helpful to have someone kind of walk you through and give you some prompts to say, "What's happening in Israel at this point?" Because it is a little overwhelming. Erin: Well, and I think there's just the practicality standpoint. I know where I am. I know what I'm going to study this morning. I've got my Bible study ready to write in, so that's great to have some good resources. Erin: You talk about trying to figure out the intersection of who you are as a believer and who you are as a mom. You talked about how you could find good parenting books and you could find good Bible studies, but you wanted to intersect those things. So how does who you are as a follower of Christ intersect with your role as a mom? Melissa: Truthfully, I think this is the hugest question that sometimes we miss as moms, because knowing who I am and what my purpose here directs the purpose I'm setting out for my children. If you walked into a mall and asked people, "What's you're purpose in life?" You'd get a thousand different answers. But I think a lot of it would come down to, "Well, my purpose is to generally be happy and be comfortable in life." That's how a lot of us spend our time raising our children. If society starts saying that success is found in sports, making money, being a perfect violin player, or whatever, all these things; we start chasing all those things as mothers because we're just trying to be happy. We're just trying to now make our children happy, and we're trying to make them comfortable. So we get in on these pursuits. I think the first question we have to rewind and back up and say, "Is that really my purpose?" I think the Bible lays out a completely different purpose—a purpose to know God, to share Him with others. That's a totally different place to start our life. If my ultimate purpose in life is to know God, that's my greatest hope for my children. That changes everything. When I think about how I'm going to spend my time and the activities I'm going to put my children in, I have to back up and say, "Is this going to detract from my original purpose? Is this going to keep them out of church on Sunday? Is this going to keep our family from getting to have a prayer time together? Is this going to take us away from family meals so much so that we don't see each other?" It starts to change how we view everything. So I think starting with our purpose changes everything about our mothering and where we lead our children. Erin: I think you're right. I think one of the lies we believe as moms is that the goal of motherhood is to raise good kids. So we do everything we can to fit that definition. But what is a good kid? Is a good kid an athlete? Is a good kid a star student? Is a good kid . . . What is a good kid? When really we don't have good kids, because the Bible says nobody's good. So we're trying to raise kids who know God which does change things. Talk to a mom who thinks, Oh, maybe I've been missing the purpose,or I've been chasing other purposes that were not this primary purpose. What is her first step toward that intersection toward who she is as a follower of Christ and a momma? Melissa: We've talked a lot obviously. Our first step in understanding our own purpose is to spend time with the Lord ourselves in the Word and in prayer. But I also say just a simple way with your kids that you could start today is say, "Hey, let's pray before our family meal tonight. Let's all pray. Everybody take a turn." And so, something simple like that is a way that we can bring prayer maybe into the home. Maybe you just put everything out on the table really quickly and everyone's ravenous and they're just eating really quickly. That's one really easy way, today, that you could really direct your purpose as a mom to knowing God. Just say, "Let's pray together for the meal as a family." It's a simple way. But it's a good way maybe to begin. Erin: Every mom can do that. Thanks. 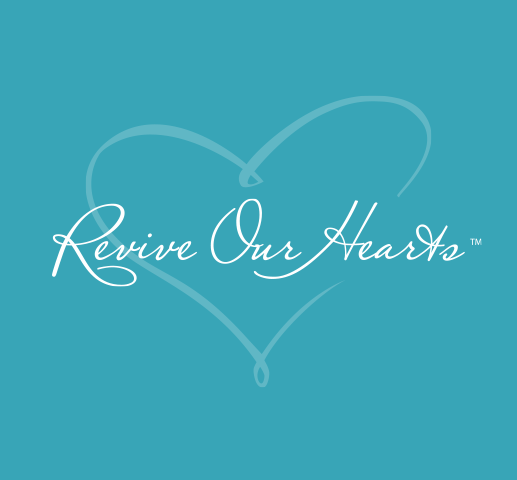 Nancy: We’ve been listening to Erin Davis from Revive Our Hearts, talking with Melissa Kruger. They’ve reminded us how important it is to keep our ultimate purpose in mind. That’s true for every busy mom. And it’s also true for all of us in every season of life. I want to encourage you not to try and squeeze the Lord into an already over-crowded schedule, but to prioritize making time in your daily pattern to get alone with the Lord and ask Him for direction in relation to your daily priorities. Stop and remind yourself what your ultimate goal in life is—to glorify God. And then take stock of your daily activities and ask, "Are they lining up with that purpose?" Melissa Kruger helps you seek God through His Word in an eleven-week Bible study called Walking with God in the Season of Motherhood. She’ll encourage you to nourish your heart in the Lord. She’ll show you how to seek Him for the wisdom you need for the roles He’s called you to. This study will walk you through some of the questions that have been discussed today; such as, what is your purpose as a mom? Are you living out your true priorities? In this new season of my life, my appreciation for Revive Our Hearts has never been greater. I am a young mom of three small children and another one on the way. At the end of the day I find myself exhausted and just praying for strength for another day, and that's when I turn on Revive Our Hearts. When my heart and body are so weary, I need so desperately that moment of turning my eyes back to Jesus. Sometimes the word brings conviction, sometimes encouragement, but always blessing. I am so thankful that Revive Our Hearts speaks the Word into my life, in all its mess and craziness. I wish I could give more back to you, but we're in a very lean season right now. I give what I can, in hopes that God will continue to bless others the way He has blessed me through this ministry! What a blessing! I'm so thankful for Madeline's heart to share this ministry with others even in small ways. Perhaps you are in a different season than Madelline, and you are able to give more. Your support will help us continue pointing women to God’s Word to find the encouragement they need to make sense of the mess and craziness of life, as Madeline put it. When you call with your donation, ask for the Bible study, Walking with God in the Season of Motherhood. We’ll send one copy per household for your donation during this series. The number is 1–800–569–5959, or visit ReviveOurHearts.com. Leslie: Thanks, Nancy. In order to effectively serve others, you need to be filled up yourself. That's true for everyone. Moms especially need to learn how to connect with the Lord while so many other demands press in on their time. Tomorrow on Revive Our Hearts, Melissa Kruger and Erin Davis return to show you how busy moms can get filled up with the Lord's power. Please be back for Revive Our Hearts.